Want to Harm Consumers and Slash Our Food Exports? Just Keep GMOs Un-labeled! Joanna Shepherd-Bailey, PhD, has released a new report demonstrating how not labeling GMOs hurts the economy, makes the food industry less competitive worldwide, has a negative impact on food exports, imports, and jobs, diminishes tax revenue, and has a ripple impact on other associated industries. This is all, of course, in addition to the harm to consumers who are forced to eat an untested and potentially very dangerous food. Balanced with the negligible cost of GMO labeling we told you about two weeks ago—with no cost being passed on to consumers—it is imperative that Washington State’s citizens pass the GMO labeling initiative, I-522. We are hoping all of our readers will visit our GMO labeling campaign page, share it with friends, family, and social media and, most importantly, take action. What will happen if we don’t label GMOs? Dr. Shepherd-Bailey’s report shows that our ability to compete worldwide in agricultural products will be harmed. With no GMO labeling or consistent testing required, the possibility of GMO contamination is a huge threat—remember the farmer in Washington who discovered GMO-contaminated alfalfa he didn’t plant growing in his fields? Both Japan and South Korea cancelled orders and banned imports of purportedly GMO-contaminated wheat from Oregon. Russia banned importation of GMO-contaminated corn. Canada banned the import of GMO-contaminated papayas from Hawaii. Since countries that require labeling already constitute the vast majority of Washington State’s agricultural exports, this huge sector of Washington’s economy is endangered if the state refuses to label GMOs. 93% of Americans want GMOs to be labeled, and 69% of the world’s population lives in countries that require GMO labeling. If foreign countries ban Washington’s unlabeled food, and only 7% of the domestic population want to buy unlabeled food, what do you think this will do to Washington State’s economy? Reduced global consumer demand for agricultural products from Washington State risks over 130,000 jobs and $33 billion (from food sales, tax revenue, local jobs, and the ripple effect on related industries such as retail, transportation, etc.). But let’s look at it another way: GMO labeling has not had a negative impact on other world economies—in fact, the reverse is true. Fully 82% of world’s gross domestic product (GDP), or $43 trillion, comes from countries that have GMO labeling statutes. By contrast, countries [checking to see if this figure includes or excludes the US] without GMO labeling laws constitute only 17% of the world’s GDP ($9.3 trillion). Big Food knows that consumers want their GMOs labeled. So it is not surprising that the Grocery Manufacturer’s Association (GMA) deliberately concealed the names of their food industry contributors while improperly collecting and spending more than $7 million donated against I-522. The attorney general of Washington is now suing the GMA for violating state campaign finance laws! GMA has finally disclosed its funders: Pepsi was the biggest contributor to the cause, giving $1.6 million. The soda company was followed by Coca-Cola and Nestlé, which each contributed a little over $1 million, according to documents. Other contributors included General Mills, Kellogg, Hershey, and ConAgra. Please keep this in mind when you buy (or refuse to buy) products. Action Alert! 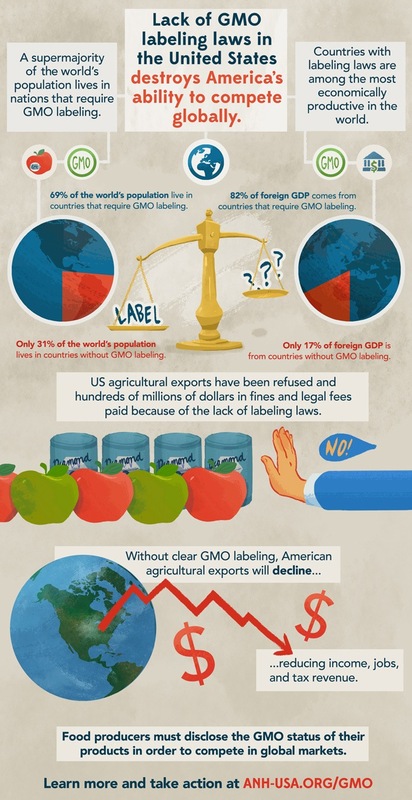 Americans are waking up to the importance of GMO labeling. This is an extremely critical time for the cause, and we need you to spread the word! Please go to our campaign page now, share the page on social media, educate your friends and family. Also write to your legislators, both federal and state, and educate them about the economic consequences of not labeling GMOs—tell them it hurts America’s economic competitiveness in the global market! Please take action today! While we work with the Virginia senators’ offices to resolve a technical issue, we ask that Virginia residents please click on the second button, so that we can collect your messages and deliver them by hand.